The Deutschland-class ships were the first heavy vessels of the German Navy after the First World War. In Germany they were classified as “Panzerschiffe”, but in other countries the term “pocket battleship” was very popular. The third and last vessel of this class was the Admiral Graf Spee. She was laid down on 1 October 1932, launched on 30 June 1934 and commissioned on 6 January 1936. During the Spanish Civil War, the ship patrolled coastal waters of this country. Before the outbreak of the Second World War, on 21 August 1939, the ship steamed out for the Atlantic. From 26 September she was fighting Allied shipping, sinking a group of Allied warships (the heagvy cruiser HMS Exeter and light cruisers HMS Ajax and HMNZS Achilles) near the South American coast. The gun battle that ensued went to history as the Battle of the River Plate. Both the Exeter and her German enemy were damaged during the course of the engagement. The commander of Graf Spee, Kapitan zur See Hans Langsdorff, decided to break off the battle and enter the nearby port of Montevideo in Uruguay. According to the international law the German corsair could not stay in a neutral port longer than 72 hours. Convinced that massive British forces were concentrating in the vicinity, and hence the escape was impossible, Langsdorff decided to save the crew and scuttle the ship. On 17 December, Admiral Graf Spee steamed to the roadsted and there the explosive charges were fired. The German ship sunk in shallow waters and her commander shot himself three days later in a hotel in Buenos Aries. The wreckage was penetrated even during the war by British divers in order to recover more valuable items and obtain information about German technology. In the post-war years many single parts of the ship were recovered. Armour: main belt: max 80 mm, deck: max 45 mm, main battery turrets: max 170 mm, barbettes: 125 mm, conning tower: max 150 mm. Kagero is a prolific book publisher based in Lublin, Poland. They produce their books in both English and Polish. This book has both languages in it. This book is soft-cover of 24 pages in 8 ¼” x 11 ¾” page format. The book comes in a self-sealing clear envelope. The beginning of the book has a 2 paragraph history of the Admiral Graf Spee in Polish and English. This is followed by 24 pages of black and white line drawings, showing every inch of the Graf Spee’s external areas. This continues onto the back cover of the book. There are 4 color illustrations showing the Graf Spee head-on, port and starboard sides and deck and stern view. I believe these are 3D, but there is no indication that they may be. Inserted into the book are two 24” x 19” sheets with more black and white line drawings on them. They are folded multiple times to fit inside the book. On one side of the 1st sheet is illustrations of the fore-deck and a partial above view. Also a 3-view of the Ar-196A-1 Arado floatplane that was carried. The other side has post and starboard illustrations. The second sheet has more port and starboard views, a stern and bow illustration. The other side of the sheet has deck illustrations and 2-views of 2 of the funnels. These drawings and not to any particular scale and all the illustrations in the book are done by the authoer Stefan Draminski. 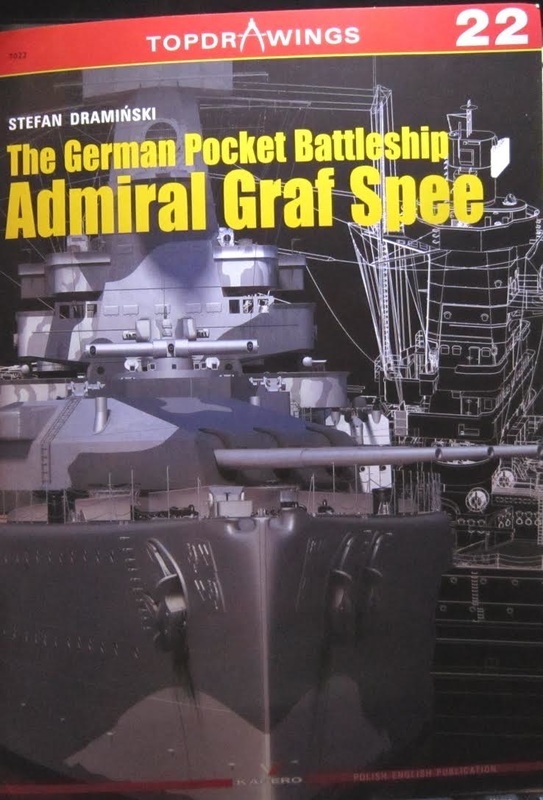 This book will be of great interest to modelers who are thinking of doing a Graf Spee. It shows every bit of the external anatomy of the ship. The book will also interest naval historians as well. Highly recommended.